“Listen carefully, be amazed, and be frightened,” said Jill Duerig, retiring General Manager of Zone 7 Water Agency at the beginning of a panel discussion at the recent fall ACWA conference on the subject of the proposed state wetlands regulations. The cause for her concern is the current proposal by the State Water Resources Control Board (or, State Water Board) for a State Wetland Definition and Procedures for Discharges of Dredged or Fill Material to Waters of the State that was released for public comment earlier this year. 4) procedures for application submittal, and the review and approval of Water Quality Certifications and Waste Discharge Requirements for dredged or fill activities. 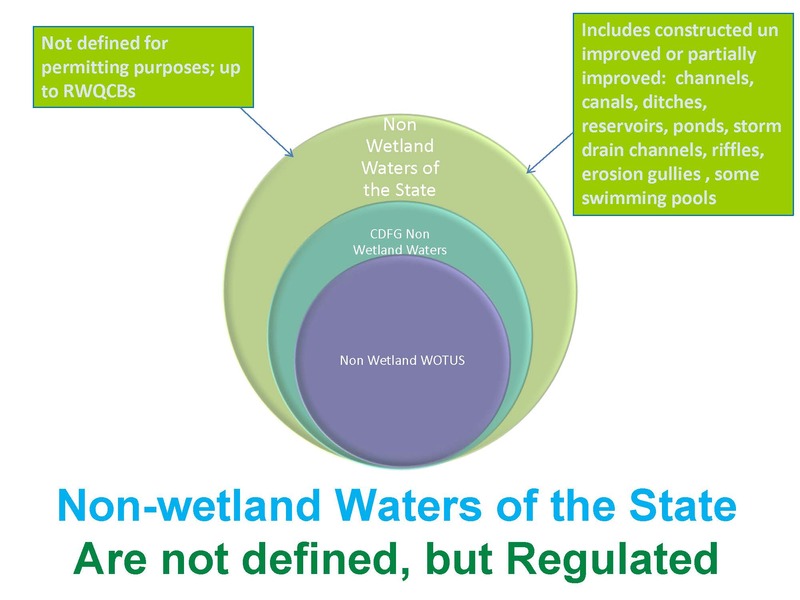 The State Water Board’s webpage cites several important issues that the procedures have been developed to address, including the need to strengthen protection of waters of the state that are no longer protected under the Clean Water Act due to U.S. Supreme Court decisions; to address the inconsistency across the regional water boards in requirements as there is no single accepted definition of wetlands at the state level; and that the current regulations have not been adequate to prevent losses in the quantity and quality of the state’s wetlands. 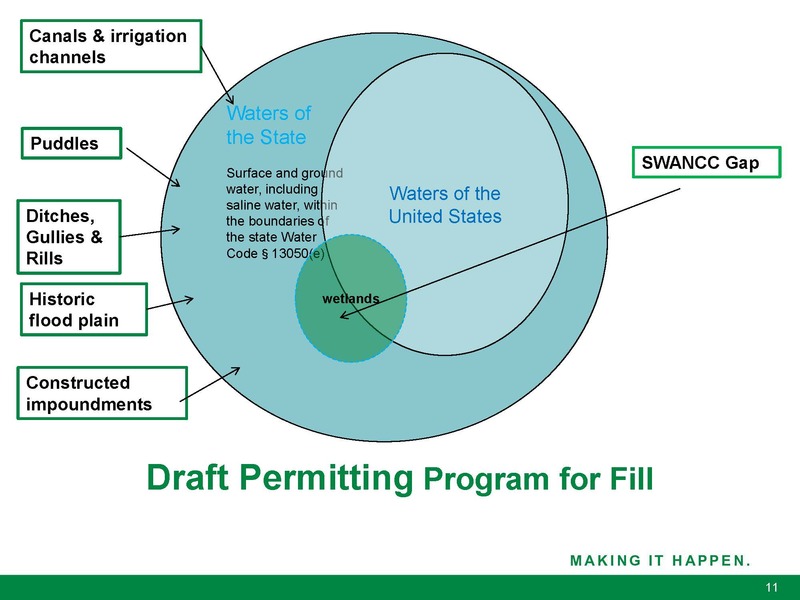 To discuss the scope of the draft regulations and the implications for urban and agricultural water agencies, the panel began with a presentation by Mary Lynn Coffee, a partner at Nossaman LLP, who gave an overview of the draft proposal. 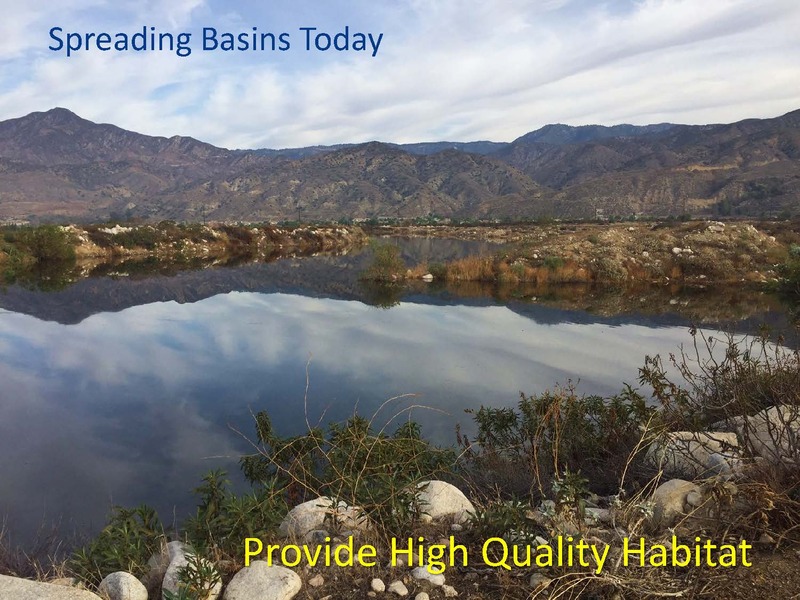 She was followed by Daniel Cozad, general manager at the San Bernardino Valley Water Conservation District and Phil Williams, general counsel for Westlands Water District who gave their perspectives. Wrapping it up with her thoughts was Hope Smythe, Executive Officer of the Santa Ana Regional Water Quality Control Board. Although the proposed regulations are referred to as ‘wetland regulations,’ they would in fact regulate much more than that, Mary Lynn Coffee began. The State Water Resources Control Board is proposing to adopt new regulations that will require the water boards to issue new Waste Discharge Requirements (WDRs) for discharge of dredge and fill material to waters of the state. “Dredge and fill material is really just a word that we borrowed from the federal Clean Water Act that really just means soil, sediment, dirt, or any kinds of discharges of that type of material,” she explained. 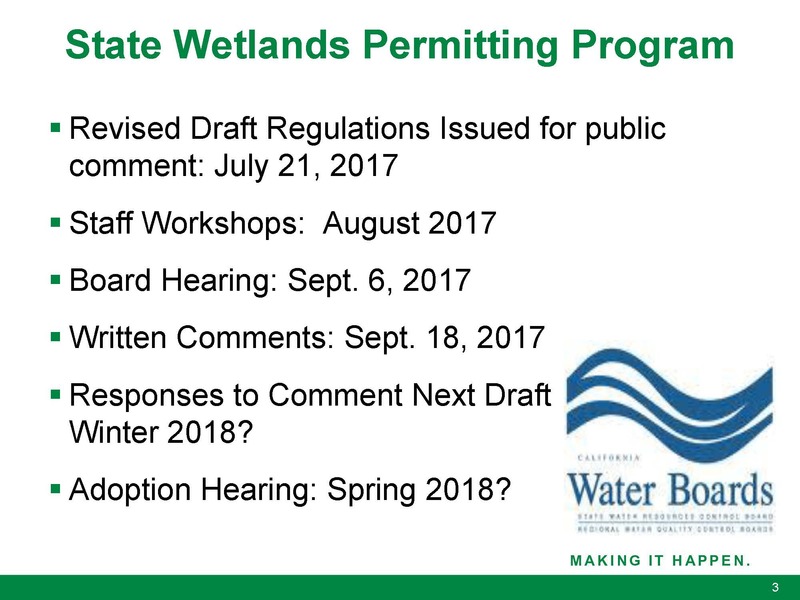 The draft procedures were most recently issued in July of 2017 for public comment. State Water Board staff held workshops in August, and held a public hearing in September where concerns were raised about the proposed regulations. Written comments were due on September 18th with responses to comments tentatively set to be published this month (December 2017) and adoption planned for spring of 2018; Ms. Coffee said that it’s looking more like winter of 2018 before any responses to comments and a new draft of the procedures will be available, although there hasn’t been an official announcement of that yet. 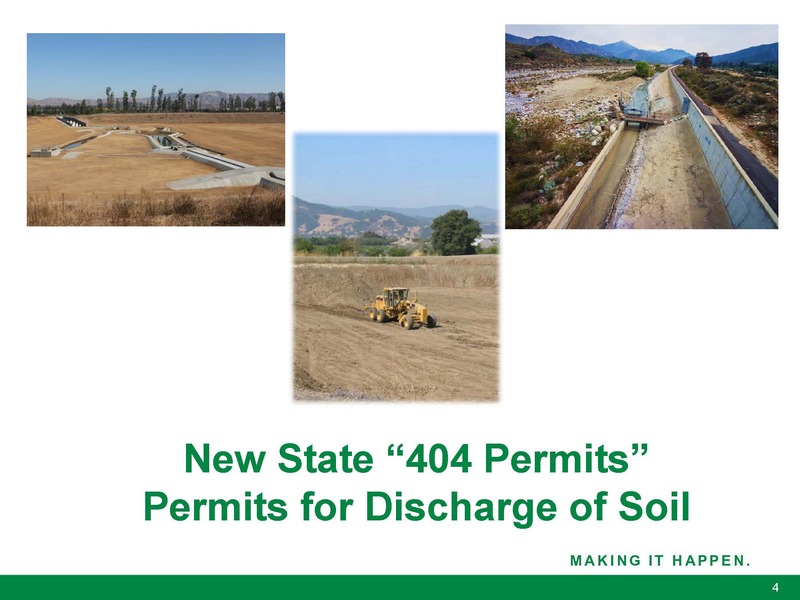 The proposed procedures would put into place a permitting program that mandates the issuance of permits for the discharges of soil into waters of the state. The proposed permitting program requires that the water board issue WDRs for any activities that might release soil into these jurisdictional waters of the state; this program will duplicate and also expand upon the Army Corps of Engineers 404 program, as well as the Cal Department of Fish and Wildlife 1602 agreement program, she said. Typical activities that can release dredge and fill material into the waters of the state are generally construction or operational maintenance activities for water conveyance and storage facilities. As defined currently in the proposal, Ms. Coffee said it includes discharges of any size, even very small discharges of soil such as incidental fallback as defined under the Clean Water Act; it also includes very minor alterations to the bed, bank, dam, substrate, and associated habitat areas for these types of facilities. Ms. Coffee presented a list of typical activities undertaken by water agencies to construct or maintain their facilities, pointing out that all of these kinds of activities are likely to result in at least an incidental if not a more serious discharge of soil, and would need one of these new permits, but only to the extent that there could be a discharge of soils to waters of the state. Waters of the state as defined under the statute in the Porter Cologne Act are defined quite broadly as any surface water or groundwater including saline waters that are within state boundaries. 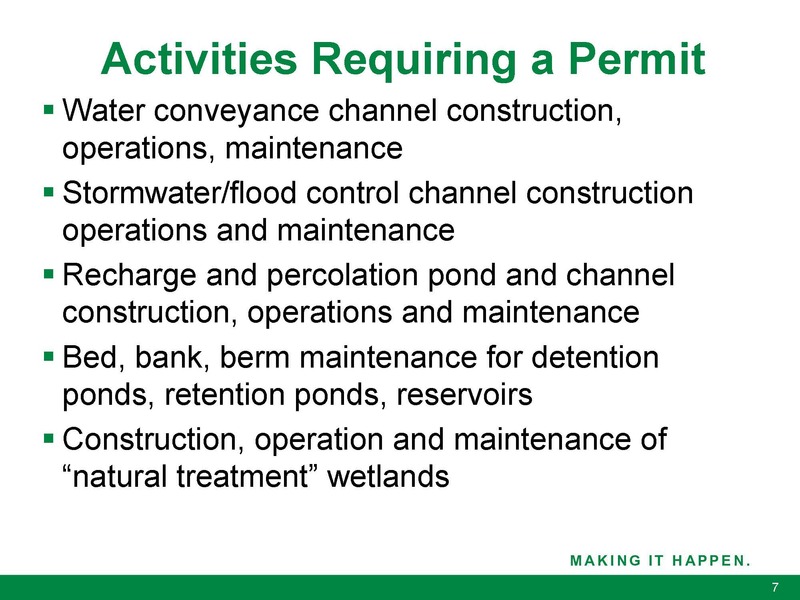 In the contexts of other permits, anything could result in a discharge to groundwater, for example, is also sometimes required to get a permit. “Because a discharge to land can be a discharge to a waters of the state, that gives you a sense how broadly waters of the state is defined in the statute in the past,” she said. The statutory definition of waters of the state is known, but currently, there isn’t a program that requires discharge permits to waters of the state; instead, the state has relied on information submitted for the waters of the US to the Army Corps of Engineers. Ms. Coffee noted that the state has sometimes issued WDRs in cases affecting typically special aquatic sites or some kind of environmental sensitive waters of the state that might not otherwise be protected by federal jurisdiction. She explained that when the program was first conceived back in 2001, it was in response to the Supreme Court cases known as SWANCC, Rapanos, and Carabel. Those US Supreme Court cases eliminated certain types of aquatic features that had been regulated by the Corps and the 404 permits from federal Corps jurisdiction. That was how the permitting program was originally envisioned, but somewhere between 2009 and 2011, the scope of the new state law for the permitting program became very different and much broader, and now the permitting program is not designed so much to protect these kinds of isolated features, she said. 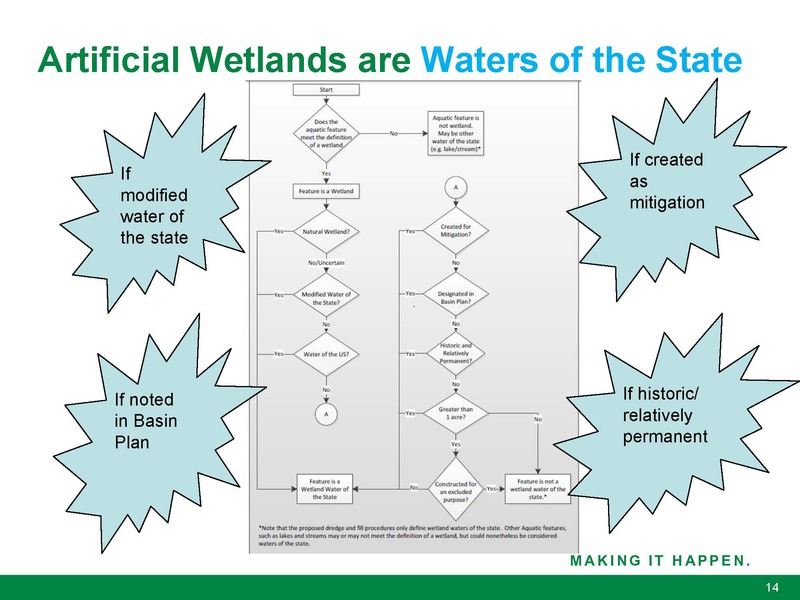 Everybody can appreciate that headwater streams or vernal pools are waters of the state, but now the program protects much more than that, she said, presenting a diagram to illustrate how waters of the state is much broader than waters of the US. She then presented a depiction of the wetland waters of the state. The proposed regulations would expand the definition of wetland waters from the usual definition. The Clean Water Act in the Arid West Regional Supplement instructs how to delineate wetlands in the Western US; simply put, what the manual says is if it has wetland hydrology for a certain number of days, hydric soils for a certain number of days, and vegetation that’s associated with hydric soils and wetland conditions, then it’s a wetland, Ms. Coffee said, noting that it only has to have that for a period of time due to the arid nature of our climate which is growing more arid as climate change progresses. Ms. Coffee said that from what she could draw from the workshops, it is actually intended to encompass some special aquatic sites that don’t have vegetation, such as salt flats. “But as the proposal is defined, it’s actually much broader than that and one of the things we’ve suggested is that perhaps it’d be better to just to name those special aquatic sites, rather than change the definition of wetlands,” she said. The scope of waters of the state is broad enough to include all kinds of artificial or constructed wetlands, and these can be canals that have riparian vegetation associated with them, percolation ponds, constructed treatment wetlands, and other things that agencies have been encouraged over the years due to their multi-benefit nature, she said. This is easiest seen on page 63 of the staff report, which has a chart which lists every test that much be passed in order to get an exemption from the new permit. Ms. Coffee said she spent time with State Water Board staff with several examples on behalf of water agencies who are her clients, and they could not find any constructed facility that could be exempted under the chart. The proposed new waters of the state and the permit for activities that release soil into them would create several new requirements that all of the water agencies are going to have to go through in order to do any O&M or construct facilities, she said. 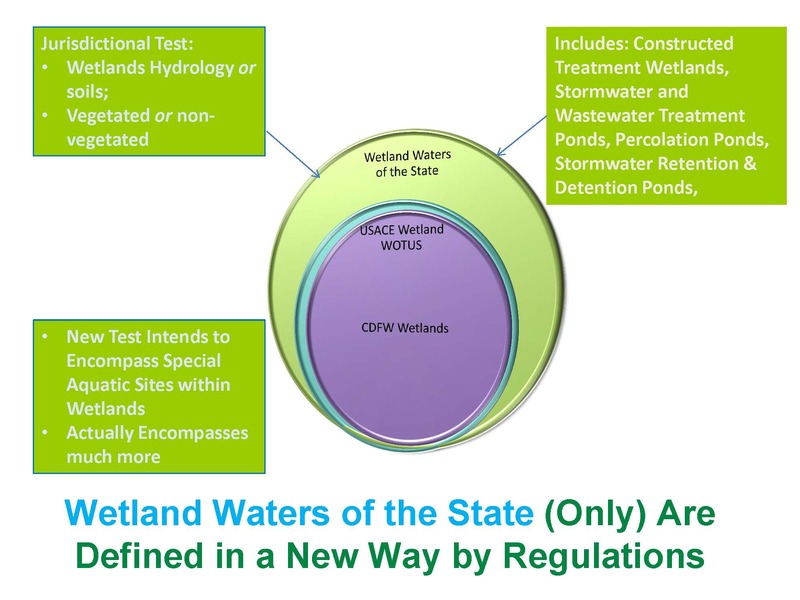 There will have to be a new delineation procedure developed because the definition would be different than the Corp or CDFW for what are wetlands and non-wetland waters. Ms. Coffee said she went through the wetland jurisdictional framework and noted that artificial wetlands will have to be delineated and while there is a definition in the regulations of wetland waters, there’s no definition for non-wetland waters, such as channels. She also noted that there’s no cross-reference that allows applicants to rely on federal delineation methods to determine the extent things like bed, bank, and ordinary high water mark. “Instead at this time, the proposed regulation just says you need to go ask the regional board if it is a water of the state if you have any thought that it might not be, so no guidance on those but they are definitely regulated and a permit is required,” she said. One of the most draconian of the new requirements is that a new 404(B)(1) alternatives analysis would be required; this is an in-depth analysis of all kinds of alternatives to the project, including a no-project alternative and alternatives that would be in other locations. The 404(B)(1) analysis will be required even for discharges where water agencies have been using Corps nationwide permits; usually under a Corps nationwide permit an alternative analysis is not required, but a state law alternatives analysis would be required for those discharges, she said. There is an exemption for projects that would only have temporary impacts, but only if all restoration and revegetation associated with that project can be completed within 1 year; if it takes more than one year to do the project and restoration, an alternatives analysis would still be required, she said. 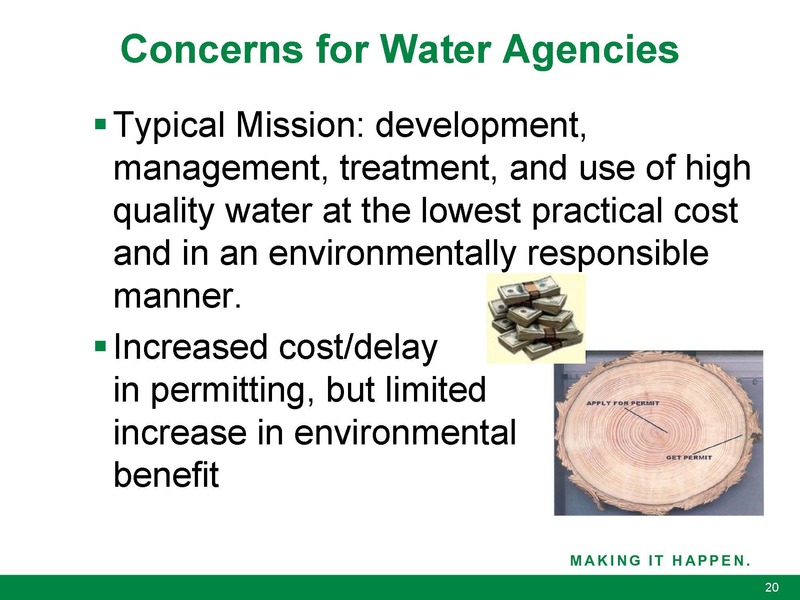 “So given the typical mission of most member agencies of ACWA to provide high quality water at the lowest practical cost in an environmentally responsible manner, the biggest concerns that the water agencies have about this particular proposal would be the costs and delay in permitting with really a limited incremental benefit, because many of these permits are the kind where we’re already getting Corps permits and CDFW permits and of course we also have Endangered Species Act rules that protect these resources as well,” she said. ACWA has submitted comments along with the coalition. Ms. Coffee noted that there are many groups concerned, including stormwater, municipal agencies, water quality, as well as ag, forestry, and other natural resource-based industries. Provide streamlined permitting and alternatives analysis exclusions for non-water dependent projects and projects that qualify for the Corps Nationwide permits. Identify non-wetland waters of the state consistent with other guidance for delineation of those kinds of water, and if there’s a desire to go further and regulate other types of waters that aren’t encompassed within the non-wetland and wetland water definitions, then we encourage the regional boards to call those out specifically as special aquatic sites. Conform the state mitigation priorities with the Corps mitigation rules so that what qualifies for mitigation under the federal law will also qualify under state law. Exempt multi-benefit constructed facilities from waters of the state or exempt them from the permit application requirements. Next steps will be further meetings with the water board staff, with a new draft of the regulations probably due in the spring to early summer of next year, Ms. Coffee concluded. Daniel Cozad, General Manager of the San Bernardino Water Conservation District then gave the perspective from an urban agency. The Water Conservation District is at the top of the watershed, and their sole job is to recharge the Bunker Hill groundwater basin; this year, they will sink about 50,000 acre-feet into the ground. He said they have very little wetlands because they are located on an alluvial fan and that means all the water goes into the ground. The district was started in the early 1900s by local citizens who figured out that if they let all the water go to the ocean in the winter, there wasn’t enough water in the summer, so they gathered up enough money to build a diversion on the Santa Ana River, he said. That diversion is still working today. Besides the facilities on the Santa Ana River, they have facilities on Mill Creek. It’s a very flashy, steep creek; there are about 48 basins there. Water is diverted mostly in the winter months, and can run through April or May for native water. In some years, there may be State Water Project water available for recharge. He noted that they did raise the issue with the State Board, and from their response, he surmised that it wasn’t exactly what they were intending. The spreading basins provide high quality habitat and most of the time, the water sinks in rather quickly. There’s a very low cost to his constituents for these recharge activities because most of their facilities have been paid off for a really long time. “So a cost like this, if we were to permit or to mitigate, we’d have to go downstream a long ways to find wetlands to mitigate for the wetlands we would take, and we create wetland areas that wouldn’t be there otherwise, so either way, it would be a huge loss of wetlands,” he said. When they divert water into the sand basins, they divert a bit of the sediment that would otherwise go into the stream, so less sediment is a benefit to those downstream, he noted. Quite a bit of sand and silt comes into those basins, so they must be maintained at least once a year. They take the sand and recycle it, sell some of it, and put some back. Mr. Cozad recommended managers look at what’s been proposed to determine if they would be affected by it. “We put 1 MAF of water in the ground fairly cheaply and effectively, we think that’s what the State Board wants us to be doing and what they want more people to be doing, so we need to figure out how to give these types of facilities the ability to do that without Hope having to come and spend a lot of her time fixing a problem that isn’t really a problem,” he said. Phil Williams, general counsel with Westlands, then gave the Central Valley agricultural perspective. He recalled how he had recently sat on a panel talking about the Clean Water Act in San Francisco and he was asked, ‘what’s at stake here’. Mr. Williams pointed out that under the proposal, landowners and water agencies will be faced with two universes: a waters of the US and a waters of the state. You may have a federal wetland with a certain set of rules and now potentially a state wetland with a different set of rules. “What’s at stake is not only significant amount of permitting requirements and making sure that you’re following through with those, but also the complexity of complying with those analysis and recognizing our responsibility as public stewards to ensure that we actually are complying,” he said. Mr. Williams then turned to the Endangered Species Act. He noted that in the last couple of years, there was promulgation of a new rule on critical habitat and modification thereof. “The way that I read that rule, it’s pretty expansive and doesn’t leave a lot of room in terms of certainty in terms of the landowner or water manager or land manager in understanding whether the land they own now may be designated as critical habitat because it may be necessary for species ten years from now or under a different set of circumstances,” he said. 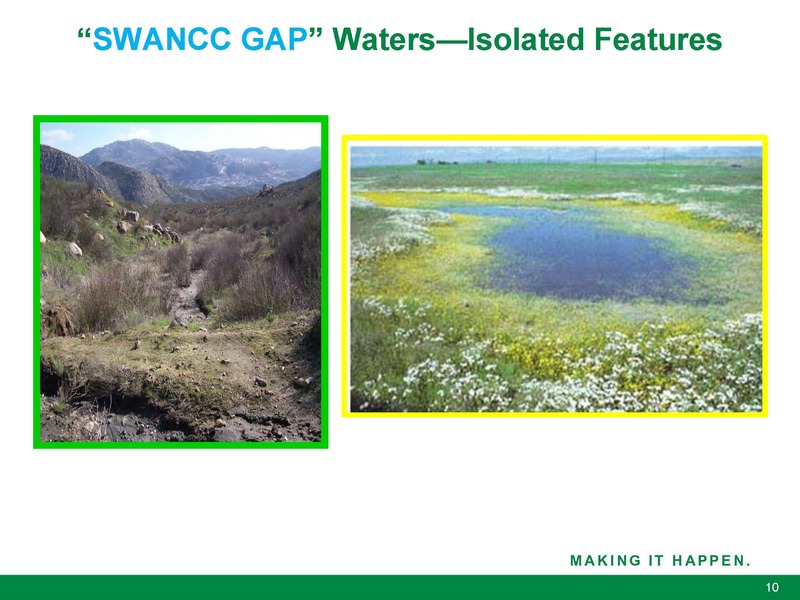 In the Central Valley, preserving wetlands is a concern and a legitimate one, Mr. Williams acknowledged. He noted that under the Migratory Bird Treaty Act, there is no incidental take or habitat conservation plan that gets you out of that. “So what do you do there when you’re talking about migratory birds that are landing now on state-delineated wetlands that are federally protected? A series of perhaps known and unknown unknowns,” he said. Hope Smythe, Executive Officer of the Santa Ana Regional Water Quality Control Board, then wrapped up the discussion with a regional board staff perspective on the draft procedures. She noted that they have heard from various applicants and dischargers that regional boards do things totally differently because there is no consistent approach. There is an important reason for having statewide procedures in place, she said. Ms. Smythe acknowledged that the new wetlands definition, delineation requirements, alternative analysis requirements, and the mitigation plans are a lot of work and different in some respects than what they do now. Ms. Smythe said they’ve been working with the State Board staff to assess how the workload may change as they have very limited resources to do these kinds of permitting activities, and so the proposal could significantly impact their workload. “It’s something that we are definitely concerned about and we’re working with State Board staff to evaluate the resourcing needs,” she said. She said in-house, they’ve been discussing the possibility of issuing general permits. She also noted She also noted that they already do issue WDRs to waters of the state for some dredge and fill activities already; it’s unknown how much that workload would increase. For the State Water Board’s webpage for the state wetlands definition and procedures, click here.